Several weeks ago, we headed south to visit family in Georgia and Florida, making stops along the way in South and North Carolina. I've already shown you photos from the Lightner Museum in St. Augustine, Florida, but here are a few more photos from our trip. Our first destination was Stockbridge, Georgia (near Atlanta) to see Tom's brother, Jim, and sister-in-law, Connie. Tom's and Jim's father flew up from Jacksonville to join us. We had a very nice visit together, mainly hanging out around the house. (The Atlanta area traffic was pretty bad.) Jim is quite a cook, so we were really pampered. After a few days in Stockbridge, we drove south to Jacksonville taking Tom's father with us. I had told Tom's father that we like to visit towns named Chester if they're convenient. I'm sure he must have really wondered about our sanity. We don't go more than an hour out of the way. 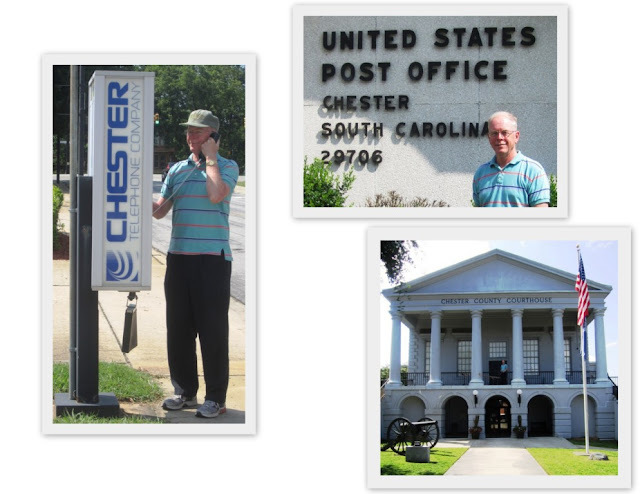 (More about our "Chester adventures" at a later date. I think we could write a small book about the subject.) As luck would have it, Chester, Georgia was only about 15 or so minutes off our route between Stotckbridge and Jacksonville. Here are Tom and his father by the sign welcoming us to Chester, Georgia. I think when we took this photo, Tom's father might have thought we were nuts. Then we saw the sign for the Chester United Methodist Church. Tom's father is very active at his Methodist Church in Jacksonville, so this seemed like a perfect photo opportunity. As he was standing there, I noticed the minister's name on the sign. His first name was Tommy which is what Tom's father's friends call him. Only one problem--the minister's last name was also on the sign. With some quick thinking, I grabbed my large knitting bag, and covered up his last name. As you can see, Tom's father really liked this. In fact, he took a copy of the photograph to his church, and they put it on their bulletin board. Our time in Jacksonville was fairly quiet. We took Tom's father out for a belated 85th birthday dinner celebration. We also enjoyed watching the Olympics, and I stitched on Mary Gibson. I got in the blue house on the left bottom. I previously showed you the house I had stitched on the right. Since the sampler doesn't look much different than when I last showed it to you, I haven't taken another photo. 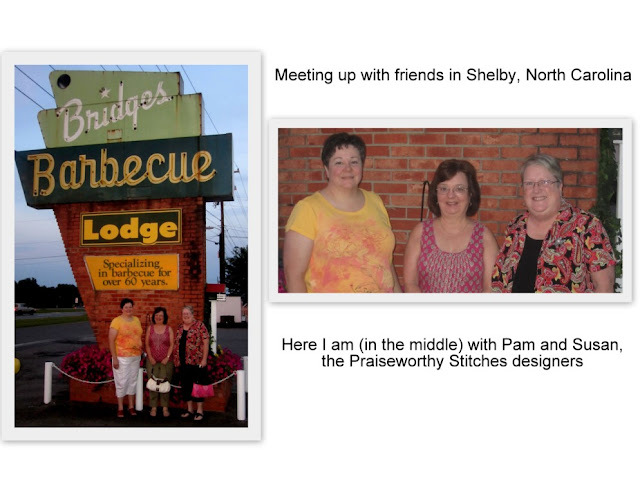 Our next destination was Shelby, North Carolina, which is where Tom's mother was from. Guess what was on the way between Jacksonville and Shelby? Chester, South Carolina. Of course, we had to stop. Chester was a charming town with lots of beautiful old houses. Here are a few photos I took. I particularly like the one of Tom at the Chester phone booth. We hadn't seen a Chester phone booth before, and now with cell phones one seldom sees a phone booth anywhere. Our reason for going to Shelby was to see how much family history we could discover. I had done some ancestry research on-line and had found quite a bit of information including the fact that most of Tom's ancestors were buried in three cemeteries. So off we went to the small Poston family cemetery and also those at Zoar and Zion Baptist churches. The Poston family cemetery is a small one in an overgrown field right off a highway. I believe there are 13 gravestones. The top center photo shows the cemetery as we approached it. 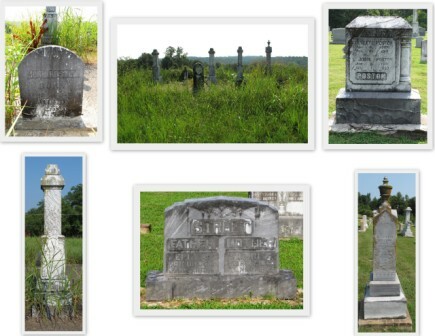 The two photos on the left are two of the old gravestones. Tom's great-great-great grandfather, John, is buried in this cemetery. The other photos shown are just a few of the many we took at the three cemeteries. We also tried to find Tom's grandfather's old farm. An internet search and a trip to the courthouse proved to be unsuccessful, so we tried on our own. Tom had not seen the farm house since about 1960, but he remembered that it was on Polkville Road, just south of Polkville. Was the house even still there after all these years? We rode up and down Polkville Road quite a few times in search of the house, stopping a couple of times to ask if anyone knew of the old Poston farm. We even took some photos on Tom's phone to send to his father to ask if any looked familiar. No success. On our second day, we reluctantly decided to give up. Perhaps the house had been torn down. However, that isn't the end of the story. Since being home, I've been in touch with one of Tom's cousins who lives in the area. I hoped that perhaps she would know something about the house. Thanks to Google Earth, Marcia was able to help us find and see a photo of the house. So the house is indeed still there. Sounds like a good reason to return to Shelby some day. Besides doing some family research in Shelby, we got to see some friends. Pam Lewis and Susan Rohm (Praiseworthy Stitches) live not too far from Shelby, so I contacted them in advance of our trip hoping that we could meet them (and their husbands) one night for dinner. When Pam asked what kind of food we like, I said that Tom would really be partial to some good North Carolina barbecue. What a fun time we all had! After leaving Shelby, we decided to spend a few days in the Great Smoky Mountains. What a beautiful place to be!! Unfortunately the photos don't portray the true beauty of this area. It probably didn't help that on the day we took the first two photos, it was very overcast. The middle photo of Tom just seemed like a photo opportunity that I couldn't pass up. And the last two photos are of elk we saw in the Catalooche Valley. We headed there after reading that there was a strong chance of seeing elk there. We only saw two, but that was exciting. The drive down there, however, was pretty arduous scary! ( I don't think Tom agrees. He thought it was an adventure.) I hadn't read the information at the Catalooche Valley website which describes the drive as twists and winds into Cataloochee. (This route is not recommended if your passengers are prone to car sickness.) Using this route, motorists will be traveling on a gravel road for approximately 45 minutes. I didn't get motion sick as I often do, but I certainly didn't like some of those dropoffs and very narrow roads. Sometimes I just had to close my eyes as Tom made those hairpins curves and hope that we didn't see a vehicle coming the other way. As I mentioned before, I haven't made much progress on my Mary Gibson sampler since I last showed it to you. I can't cross stitch in the car. So, I knitted instead. I completed one prayer shawl for church and am pretty far along with the next one. Since being home, I've been working on some mini-Quaker samplers and also on a new sampler. More about that another day. Oh, Ellen,I wish I had known you were going to Chester, SC--my mother's family hails from there! She grew up in the area and I spent a good deal of my childhood visiting my grandparents. They lived "out in the country" in a house that started out as a log cabin in 1752 but was expanded over the years as the family and family fortunes grew. Sounds like such a fun trip! 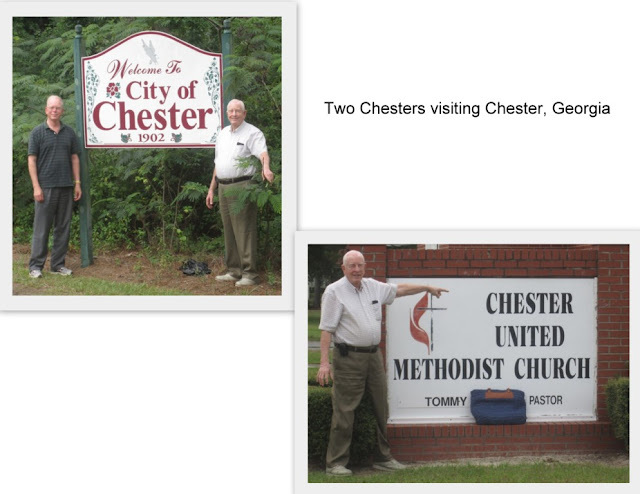 I love how you take photos in front of signs for towns named Chester! And that pic of your father at the church sign -- priceless! 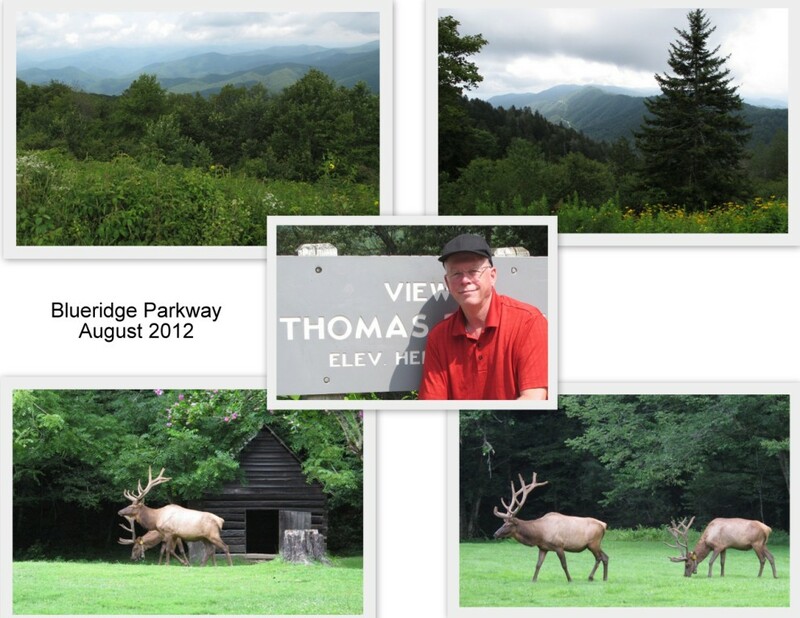 The Smoky Mountain pics look wonderful -- so cool to see the elk! It looks like a fun trip. My husband is seriously interested in genealogy so we have made many similar trips! The name photos were fun! Your tales about your stops in towns named Chester were fun to read. It reminded me of the time we stopped in Diana, TX to take a picture of me at the Diana post office. ( I guess you figured out that my name is Diana) I don't know if there are anymore towns named Diana, but if we were near one, I'm sure we would stop. I look forward to taking a class with you in October.